Jamelle and Domikah were married on Sunday, Aug 27, 2018 at the beautiful Bella Donna Chapel at Adriatica in McKinney, Texas. The small chapel is surrounded by a body of water and makes you feel like you are in a small village in Italy. This is one of my favorite venues to officiate a wedding ceremony because of it’s beauty. 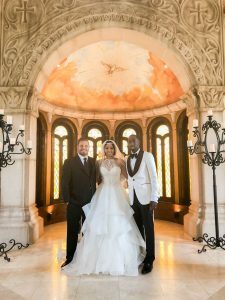 Jamelle and Domikah entered into the chapel to Christian praise and worship music and kept the ceremony based on God’s goodness and faithfulness. They chose to share personal vows that represented their faith and devotion in each other and God in a beautiful ceremony performed by Rev. James Bray. It was an amazingly beautiful ceremony photographed by Blair Glover Photography.